The Shear Blender offers flexibility for a variety of products. The clearance of the Ampco Shear Blenders can be adjusted with the use of simple shims (provided) to get the blend quality desired. Different impeller profiles provide specific shear effects. The SBI offering pumping capabilities with the integrated impeller. The Shear Blender offers flexibility for a variety of products. The clearance of the Ampco Shear Blenders can be adjusted with the use of simple shims (provided) to get the blend quality desired. Different impeller profiles provide specific shear effects. 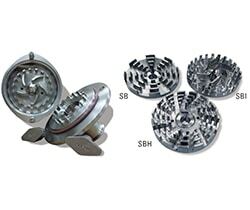 The SBI offering pumping capabilities with the integrated impeller.